I first started choosing summer reading books for my children in 2011 when I read an article about summer learning loss. 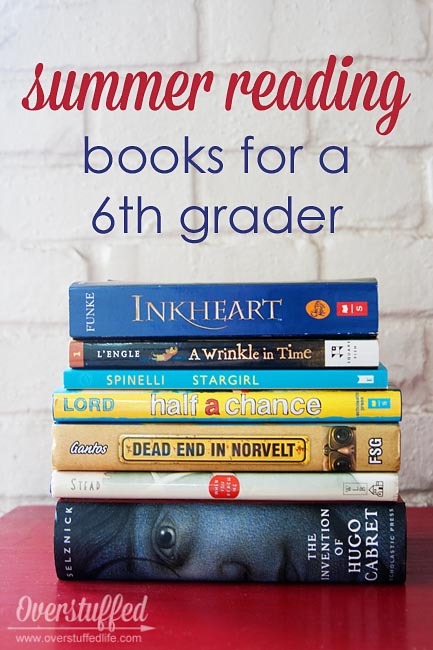 Of course, I have looked and looked and cannot find said article again, but it said that if kids read just one book a week during the summer, they have significantly less learning loss and they are much better prepared for the following school year. 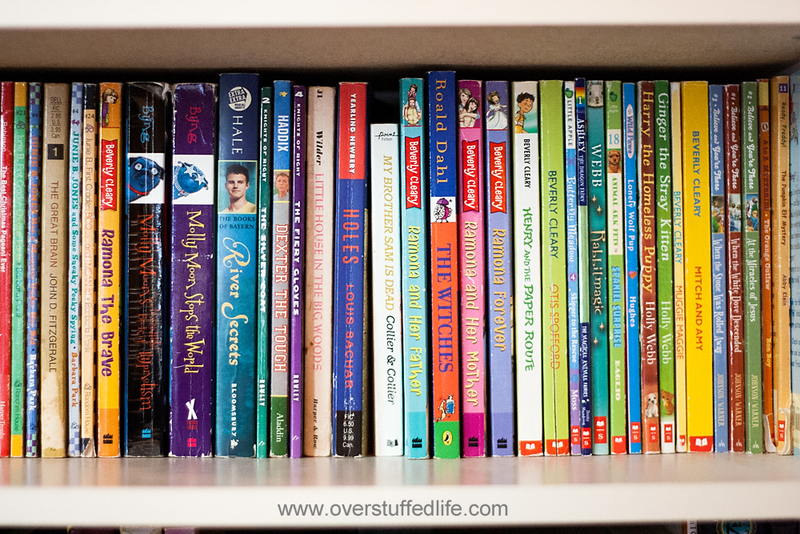 The first year, I actually chose all twelve books for my kids. Bad idea! They still wanted to choose some of their own reading material. Duh. In my excitement to start a summer reading tradition for them, I hadn't thought of that. No matter, they read part of what was in their reading bins, and they read many other books of their own choosing. Each of them read well over 12 books that summer, and I was thrilled. Now I choose 6 or 7 books to go in their reading bins. I don't care if they read all of them or not. I have incentives in place for them to actually read 12 books over the summer, and they usually read more than that so I am happy. The books I choose to put in their reading bins are books that they might not have heard of or probably wouldn't choose for themselves. I'd like them to expand their reading options, and so far it has been a great experience for all of us. They usually read and enjoy most of what I put in their bins. 1. I Google the summer reading lists that many schools issue for each grade. I find a wealth of information this way and get a really good idea of which books are right for their age group and reading level. I also find many newer books I haven't heard of, as well as the classics that I already know about. I also Google which books won awards this year and why. 2. We have a lot of books at my house. So, I go through these lists and check off books we already own. 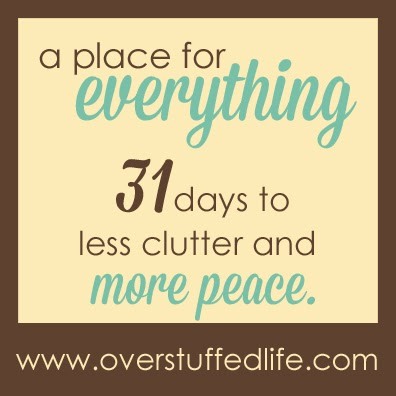 I don't necessarily put them all in the pile, but it's good for me to realize what we already have. 3. I make a list of the more interesting books from the lists that I do not own. 4. I then try to choose a mix of classics and more modern books, and a mix of thick and thin books. I don't want to overwhelm them with a bin full of big, fat tomes, nor do I want to overwhelm them with all classics. I also don't want to have the opposite problem occur. 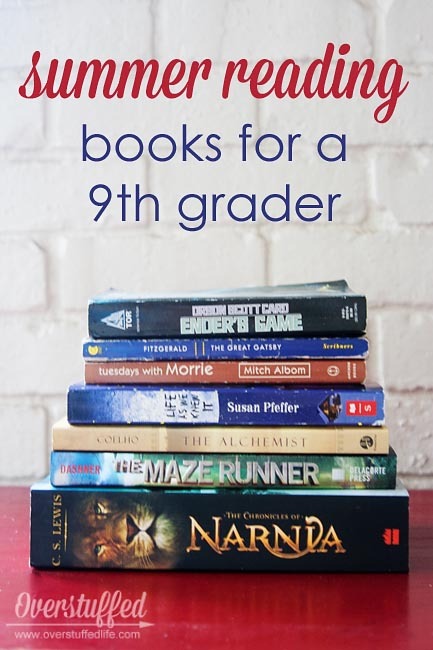 I take into account the genres they already love to read, and make sure a couple books I know they will like are included, but I also include other genres to help them branch out and perhaps find new favorites. 5. I usually make up their bins of 3-4 books we already own, and 2-3 books that I purchase new for them. The Maestro often earns a nice Amazon gift card at the end of his school year, and I always use it for summer reading for the kids. This year I only spent 9 dollars out of pocket on 7 new books due to his gift card. Bria was really excited when, in the first week of 7th grade English, she found out she would have to read Animal Farm by George Orwell. She came home and told me that because it was in her bin that summer, she read it and was already that much ahead! Plus, her teacher was pretty impressed that she'd read a book like that on her own already. This is just one of the benefits of choosing some literature for your kids to read over the summer that they might not otherwise choose for themselves. Bria most enjoys dystopian literature and has pretty much read it all. She recently saw the movie Ender's Game and enjoyed it, so I thought she might like to read the book. Life as We Knew It is also a good end of the world sort of read (I loved it), and The Maze Runner is one she's just never read for some reason. The Alchemist is a book I found on many Freshman reading lists, and one that I personally really liked. I had a copy of it once, but lent it out to somebody and never got it back, so it gave me an excellent excuse to buy a new copy. For more classic books, The Chronicles of Narnia (she has mentioned wanting to read them), The Great Gatsby, and Tuesdays With Morrie. Chloe hasn't really settled on a favorite genre and reads pretty much anything and everything. She also seems to LOVE everything she reads, but that's just how Chloe is. I got her The Invention of Hugo Cabret because she loves art so much and this book is mostly (amazing) illustration. Dead End in Norvelt and When You Reach Me are both more recently published, both with much acclaim. I've read both of them myself and I know Chloe will really enjoy them. Inkheart is one I'm not sure about for her, but it was on a list I saw and also on our shelves, so it went into the bin. Half a Chance and Stargirl both looked like easy, fun summer reads, and for a classic read, I chose A Wrinkle in Time. It figures heavily into When You Reach Me, so I thought it would be fun to read both books this summer. Sophia has been much more into reading "big books" this year and has even recently tackled an abridged version of Little Women! She is going to do Charlotte's Web for her Book Club this summer, and a friend of hers is also going to do a book club and chose Pippi Longstocking (not pictured—still on its way from Amazon!). The other classic read I chose for her is Sarah, Plain and Tall. Chloe loved it at Sophia's age, and since it's not long or daunting at all, I think Sophia will enjoy it. The Candy Shop War may be the biggest book she will have read to date, but I think she will have fun with it! The rest (The BFG, Only Emma, and About Average) are fun and easy. I hope to see her reading a lot this summer—she is my most reluctant reader simply because she has so much physical energy inside of her. I'm hoping these books keep her really interested. Thanks for these ideas. I loved your earlier post that linked to different programs offered around the country too. May I just offer that we recently took a long road trip to Utah and decided to get Inkheart as a book on CD. The whole family listened and my kids couldn't wait to get back in the car and turn it on. The actress, Lynn Redgrave, who does the voices is amazing!!! Even my two year old didn't do too badly and it's somewhere between 14-16 hours. Derek and I loved it too, so it really was a win-win for the whole family. I recommend it to anyone who wants to get away from the portable DVD players for their next road trip. On a side note, I had really good luck going to Goodreads and looking at literature aged for my 6th grader. There were some good ideas there as well. 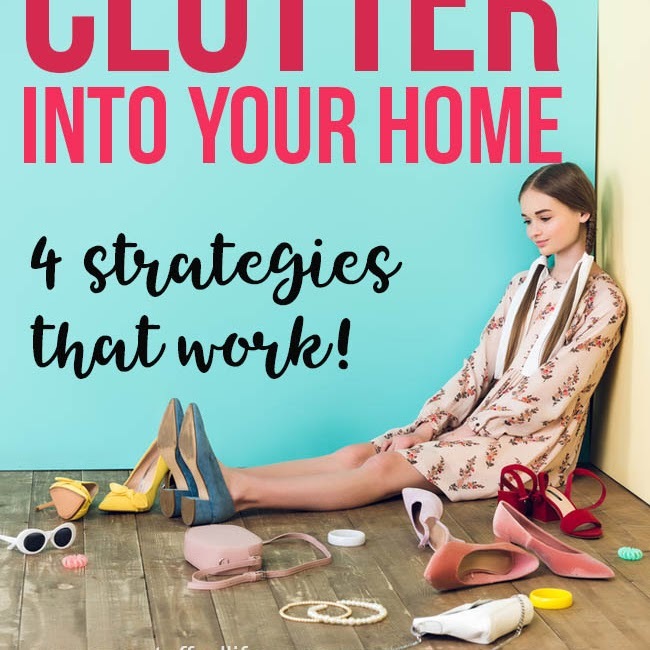 I was highly disappointed with Pinterest and amazon--zero luck there. Looks like some great choices. Can't wait till my lil man is older so I can plan a reading list for him! I want to read Maze Runner. I haven't read Stargirl yet...(I do try to read everything i want my kids to read). I bought it for this summer, I thought the description seemed really great! Glad to know you liked it. I also loved Tuesdays with Morrie. You can start now and plan a fun list of what you'll read to him! I saw the preview for the movie a couple weeks to go and thought it was really intriguing! I want to read it now, too. It's so hard to get children to read during the summer. I don't know how you do it but these are such good suggestions. I love it. Hi Beth, Thanks for these excellent suggestions! Chloe has read Rules and Wonder already and loved them. I originally had The Giver on her list for this summer but couldn't find my copy anywhere. I must have loaned it out to someone and not gotten it back, darn it! I will look at the others you've recommended, I always love seeing new book suggestions! Ariel and I went to Barnes & Noble Tuesday and picked out a few books for her summer reading. She has to read A Wrinkle In Time for school--lucky for her we read it together earlier this year! She loved it!! She also recently loved reading Tuck Everlasting. For her summer reading, she's starting with Breathing Room, Popular, and Code Name Verity. A little fiction, some non-fiction, and a lot of variety! 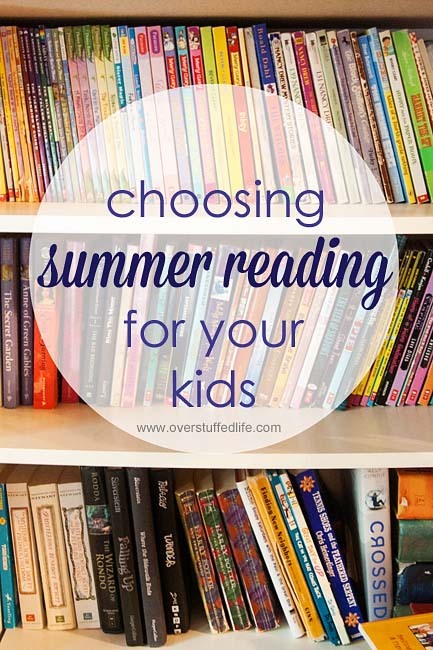 I love the idea of choosing some 'required reading' books for your kids each summer as well as letting them choose books they want to read, too! 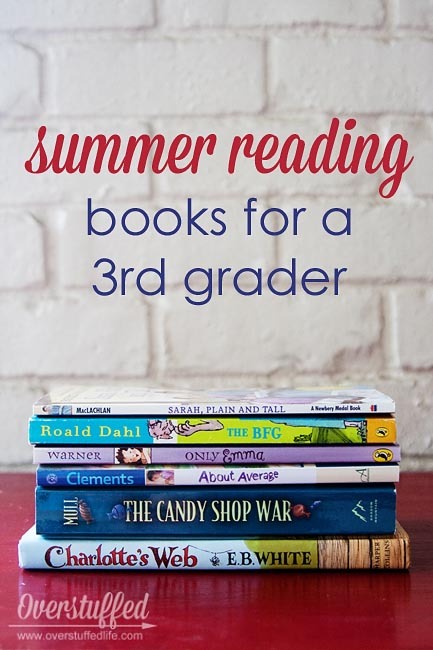 It's so important to keep them reading through the summer! Great choices! Chloe also loved Tuck Everlasting--she came down to my bedroom one Saturday morning after finishing it and retold the entire book to me. I loved that. Amen. I love nothing more than to see my kids reading a lot in the summer. All three of my kids are little bookworks this summer. I love it! (Thank you summer reading program!) These are great lists. Two book series my kids love (they are also fun to read out loud as a parent) are "Creature in My Closet" by Obert Skye and "Raymond and Graham Rule the School" by Mike Knudson and Steve Wilkinson. Both series will make your kids laugh. I think they would work well for reluctant readers (especially boys). They are easy for younger kids but fun for the older kids. I don't know if you've already read the book "Treasure Hunters" (http://www.amazon.com/Treasure-Hunters-James-Patterson/dp/031620756X/ref=sr_1_1?ie=UTF8&qid=1425527899&sr=8-1&keywords=treasure+hunters) but it's got some great pictures too, and it's in the reading range for Chloe. It's a fun story and I enjoyed the art! I can't recommend enough the Mercy Watson series by Kate DiCamillo. It's a chapter book series suited for boys or girls in second grade. I even loved it! I bought the book series for my son's teacher as well and all the kids loved it. Several stopped me in the hall to tell me they checked Mercy Watson out of the library or bought their own copies! Never had that happen with a book before!! I do love Kate diCamillo! I will have to check out that series, though I haven't read it before. Thank you! As a lifetime book-devourer from a family of insatiable readers, the idea of a kid needing to be nudged into wanting to read is alien to me, but I know it does happen. I have great respect for parents who are enthusiastic about encouraging the love of reading. My daughter and I have read all the books on your list and give you two thumbs up for your great choices. If your eldest saw the film of Ender's Game, I'll bet she'll find the book much richer and more satisfying. I think of The Great Gatsby as a "revisting book," one that can be read again at different times of life, with each reading adding to the experience. Charlotte's Web is one of my favorites too. Not only is the prose exquisite, I love both the humor and the messages about friendship.